We are still working on finalizing documentation. It will become available very soon! First question you need to ask is which PiBurn configuration do I need? What kind of plug I need? When ordering PiBurn you will be asked to choose correct plug wiring. All plugs provided with PiBurn are “aviator type” like seen on the image below. Socket (on the left) is already installed on your laser machine. Plug (on the right) is what comes with PiBurn. Because it’s impossible for us to wire our rotary attachment for any possible Laser machine manufacturer, we might need your help to provide us correct wiring option. This one will work with Boss Laser machines. So if you have one of these laser cutters, you are all set! This type of plug was tested with no-name 50W Blue and White Chinese laser from eBay. There’s no 100% guarantee that your machine will be wired the same, but it’s a pretty good bet. We will wire plug for you if you can provide a wiring schematic or send a note with your order about how your socket is wired (each connector is labeled 1 thru 4). If you do not have documentation with wiring diagram, it’s pretty easy to find out how your Y axis plug is wired into stepper driver (i.e. which wire goes to what terminal). For 3-phase driver you’ll need to find out which wire goes to “V”, “U” and “W” marked terminals on Stepper Driver. For 2-phase, trace it to “A+”, “A-“, “B+”, “B-” terminals. If you wish to solder wires yourself, choose this option. Will will include a 4 pin plug but it will not be soldered to the motor wires. You will need to know how to solder and have soldering iron for this option, however soldering these plugs is very easy even for a beginner. Finally, it’s worth mentioning that plug can be replaced and even changed with an adapter that we plan to offer to those customer who need it. We’ve already designed an adapter and testing it out. It will allow you to quickly connect plug that’s not correctly wired for your machine, or even swap PiBurn between different laser engravers! What kind of motor do I need? 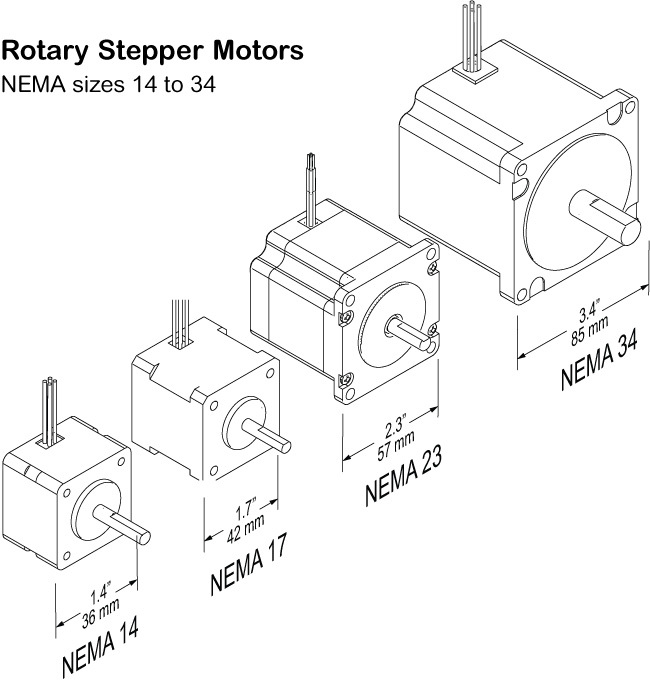 PiBurn uses Stepper Motors in Nema 23 sizes. These come in 2 phase and 3 phase types. It’s very important to know type your laser machine can use. This should be same motor as one that drives your Y gantry. If you own a Boss Laser machine, look at your machine model. All laser models LS-16xx and above use 3-phase motor. Anything below that (like LS-1420) is 2-phase. Now if you have different laser, easiest way to tell if by looking at your Y axis motor. Trace cable that’s coming of your Y axis motor to the plug. Check plug or socket (you might have to look from inside of the machine) to see how many wires it has. 3-phase stepper motor usually have 3 wires, sometimes 6. 2-phase will have 4 wires. Still can’t tell? Each stepper motor in your laser is connected to it’s own stepper driver. It should look something like on the picture above. There are 2 ways to tell if it’s 2-phase driver or 3-phase. If you can clearly see model number, search online and read it’s description. Alternatively take a look at “High Voltage” terminal block. 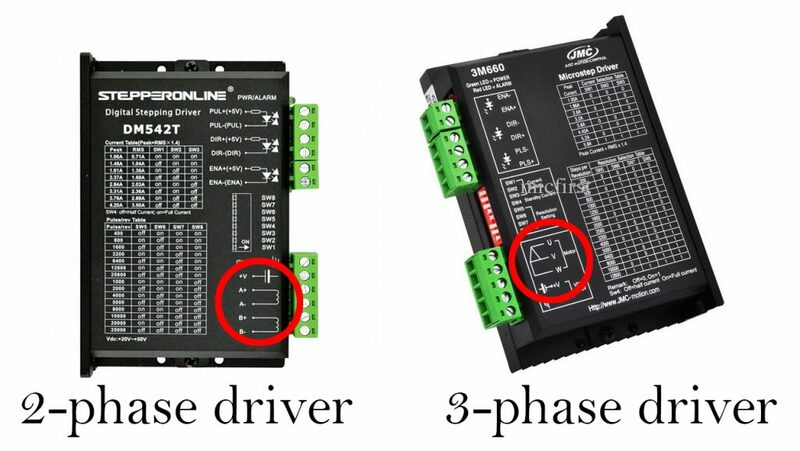 If it has marking “U V W”, it’s a 3 phase driver and you’ll need 3-phase motor. If it has markings like “A+ A- B+ B-“, it’s a 2-phase driver and you’ll need 2 phase motor! Reach out to us if you have a question!